Every person, no matter what age or ability, has the need and desire to be productive, useful and engaged in life. Unfortunately, part of everyday life for much of the elderly population includes loneliness, a lack of purpose and often illness and depression. Although pet ownership comes with a lot of responsibilities, the rewards and benefits are great. Becoming a pet caregiver and nurturer at an older age brings a sense of being wanted and needed, a reason to get up in the morning and a friendly canine or feline face to greet you. It’s impossible not to smile when you start your day with a wagging tail or a purring cat waiting for your attention. Pets bring routine to daily living as feeding times need to be adhered to, grooming needs attended to, and dog walking schedules kept. Walking a dog is healthy physical exercise for both the dog and owner. 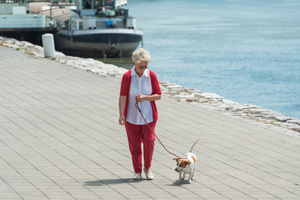 In addition to the health benefits for the elderly owner, dog walking encourages social interaction. Walking in the neighborhood or a dog park gets you out of the house and puts you in contact with neighbors along the route or others also walking their dogs. Dogs are great ice-breakers. Most passersby cannot help but smile or stop to chat and pet your dog. Encountering another dog owner on a walk presents a chance to discuss each other’s pets and share tips with someone who has a common interest. Dog walking can be a social event and many friendships have developed while walking a dog. If you have a physical disability that prevents you from walking your dog, hiring a dog walker provides your dog with the benefit of exercise and adds another person to your life that will be happy to discuss your dog and their walks with you. First time pet owners add a new interest to their lives and may want to spend time researching the characteristics of the particular dog or breed, training recommendations, vet services in the area, dog friendly parks or local pet stores. New interests stimulate the brain and add excitement to boring days. They put some pep in your step. Seniors contemplating adopting a pet may want to consider an older, unwanted pet. Seniors understand the challenges of aging and have the time to care for and interact with aging pets that would otherwise be euthanized solely because of age. 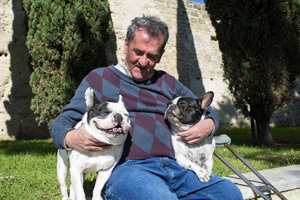 Just as with older people, older pets have much to offer. Cats require minimal care, just a litter box, food and a few toys. They provide the same companionship and health benefits as dogs. The physical health benefits of owning a pet are becoming recognized by doctors treating an aging population. Recently, some doctors who specialize in the care of the elderly have prescribed animal handling sessions for their patients with great success. Exposure to petting and interacting with animals has proven to be good medicine, in particular, has demonstrated a dramatically reduced risk of heart disease. The list of additional health benefits for pet owners is impressive and includes lower blood pressure, lower cholesterol levels, increased mobility, less depression, reduced stress, fewer headaches, better hygiene, less indigestion, improved sleep and fewer doctor visits. Aging often comes with physical discomfit to some degree. A large number of elderly patients report to their doctors that a pet helps to ease pain, that spending time petting, grooming or playing with their pet distracted them from the pain and helped them feel better. The emotional benefits of pet ownership are even greater. Pets provide affection and unconditional love. They are loyal and compassionate companions. Most pet owners talk to their pets, they feel free to confide in these non-judgmental listeners who help lessen sadness. Life’s losses are eased, isolation is decreased and loneliness is reduced. The focus changes from physical problems, loss and aging to a renewed sense of purpose and responsibility. There is a new reason to live. Pets also provide us with security. They warn us of possible approaching danger and most will protect their owner in a threatening situation. They also warn us of approaching friendly visitors. There are no surprise visitors with a dog around. Pets are also a source of entertainment. Every pet has its own personality, habits and quirks. Introduce a few toys and watch the antics begin. 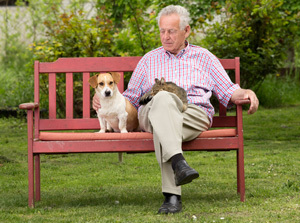 Pet friendly senior living communities are thriving all around the country. If you have an apartment or room in one of these communities you are allowed to have a dog if you can adequately care for it and it doesn’t disturb other residents (barking all night). Sometimes there is a size or weight limit to the pet you are allowed to have. For those who are unable to physically care for a pet there are “Pet Coordinators” whose job is to help care for the pets in the facility if an owner is unable. They walk dogs, feed animals, groom, give medications, play with pets and talk with the owners about their pet. Other facilities that do not allow residents to own pets have a community pet, a dog or cat that lives in the facility, is cared for by the staff and roams the halls in and out of rooms visiting all residents. Other communities allow pet therapy visits, where animals are brought in from outside at a scheduled time and residents are able to touch and spend time with them. This is a much anticipated activity for residents in those facilities.